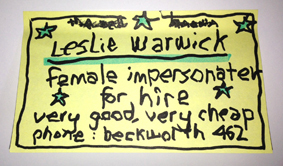 Hello, I’m Leslie Warwick (you’ve probably heard of me) and this is my first time writing on a face book. It’s just like writing a letter to a lot of people isn’t it, but without needing to use lots of paper, hunting for envelopes, steaming off and reusing stamps, or for that matter, searching out an unvandalised postbox. The great thing about this website is I can use it to get bookings, it’s cheaper than sticking a note in the newsagent’s window. As it say’s on my business card (Please see below) I’m a well-known female impersonator, available to book for children’s and adults parties, weddings, redundancies, and funerals, that sort of thing. Please contact me through this site, I currently have every afternoon and evening free (plus all day Sundays) to do gigs, as they are called in the heady world of showbiz.